Yes I have spent many hours on the site. However, any searches take me to the Kinlock mine and its closing as my grandparents bought the office & community center when the town was sold. They converted the office into a home then later into 2 large apartments, one of which kept the 2 story high safe in it. In the 1980's the family matriarch had the main floor remodeled into an apartment for her retirement. The safe combination lock door was removed and the inner metal doors kept on as a pantry/storage area with a laundry room next to it. The community Center was used several times as a bar by several sons. The one son also had boxing matches in the gymnasium on the second floor. Later my grandfther had my dad, who had a plumbing & heating business, convert the second floor into 12 hotel rooms; ladies bathroom and men's bathroom & huge linen closet. Later my dad & his crew built a 6 unit motel in a seperate building beside the hotel/bar. There are seveal major errors on the entry. Because the main road was moved from running right beside the buildings, to a small highway 1 1/2 blocks away, the sign for the hotel/bar was placed on the apartment building so it could be seen from the new highway. The photographer & author assumed that was the bar/hotel & it wasn't. My husband's grandfather and his grandfather's brother came to Simpson PA from Lithuania to work in the coal mines. Not sure what got them to come to PA to work in the mines. I know his Grandfather's brother came here first and then his Grandfather came over. Anyone else have relatives from Simpson PA? There surname was Pieczul/Pechulis. dsnyder, is this your great grandfather's naturalization record? This Naturalization paper is my Great Grandfather. 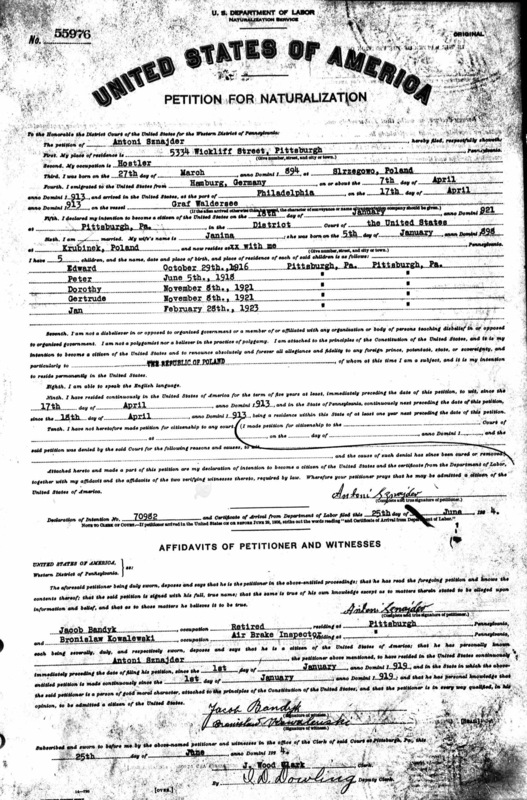 Hi gpreco714 - how cool to find that even though Cheri found the wrong naturalization paper for dsnyder's great grandfather, it looks like it brought you here to PolishOrigins! Welcome! I attached the document that Cheri found earlier so it could be with your posting. My great-grandparents went to Pittsburgh too! Thank you. I am trying to determine where they came from. On different paperwork different towns are listed. My great grandmother also was naturalized because Antoni died of consumption right around 1930. My own grandfather died in 1958 when my mother was a child so I never had any exposure to my Polish relatives. Miners preparing for entry into a bituminous mine, southwestern PA, circa 1910. Credit: the Pennsylvania State Archives. This photo, circa 1910, is a of a mining town in Fayette County, Pennsylvania. Fayette is south of Westmoreland County. My grandfather worked there when he first came to America. Tonight I quickly scanned all post on PA miners. I have this document that addresses immigration and life for Slavic immigrants, especially those that went to the anthracite fields of northeastern Pennsylvania. However, there are commonalities for all Slavs and life for the immigrant miners. 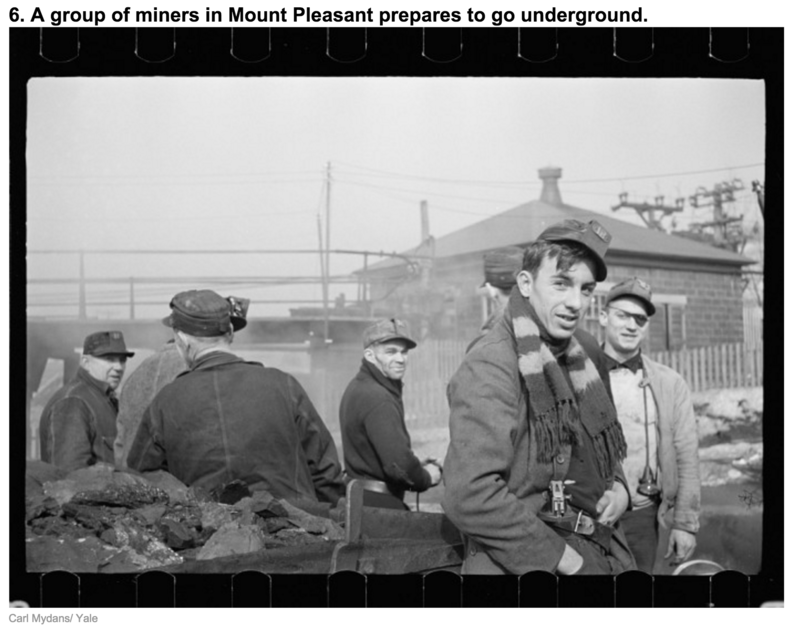 Another cool old photo of PA coal miners in Mt. Pleasant PA. This is where my great-grandfather first worked when he arrived in the US, several years before my great-grandmother and the children arrived. If I found someone on http://www.phmc.state.pa.us/bah/dam/rg/di/r45_MineAccidentRegisters/r45-14AccidentRegistersInterface.htm in one of the reports, specifically on http://www.phmc.state.pa.us/bah/dam/rg/di/r45_MineAccidentRegisters/LsBituminous1907_1917.pdf, how do I go about getting the report? Do those exist anywhere? I am hoping there is genealogical information to be found. In ca.1910 the Westmoreland Coal Company employed 608 men and boys at the Export Mines, many of whom were becoming increasingly restive over the coal company's refusal to recognize the United Mine Workers of America as their union. 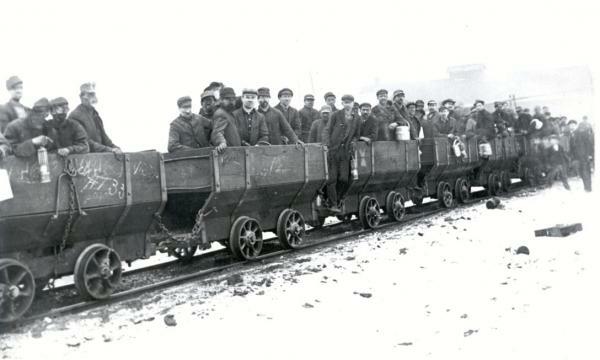 Workers at Export and other mines in northern Westmoreland County began a long and arduous coal strike in the spring of 1910. 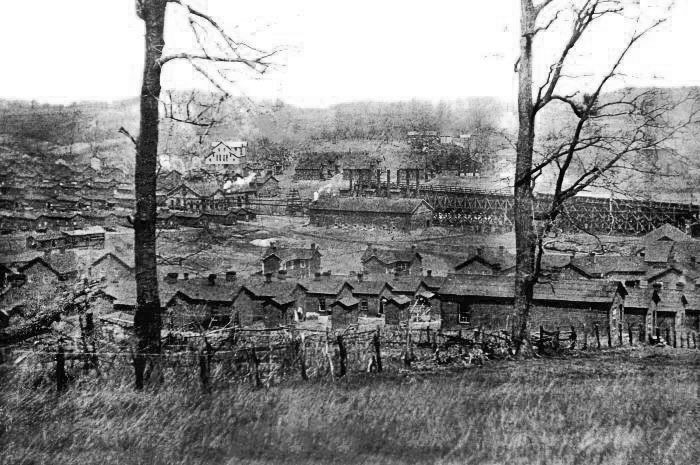 The Westmoreland Coal Company evicted many of the families from their houses and brought in the dreaded "Coal and Iron Police", a private police force, to maintain control of company property and to safeguard the replacement workers "scabs," that the coal company imported from the south to work in the mines during the miners strike. More than a year later the strike ended in defeat for the weary coal miners. So, my great grandfather perhaps was the "enemy" of your ancestors. BTW- neither his children nor his second wife ever put a headstone on his grave. He was not Polish. He went back to "the Mayflower". ...I just received my aunt's birth record and found that my grandparents were peasant farmers from Wydmusy-northeast of Warsaw. My other set of grandparents were fromStazkowka in the Austrian section. Their families began emigrating in the 1880,s and would love to understand what they all went through. Interestingly enough both sets of grandparents settled in the coal mining region of Pennsylvania and were all coal miners. Welcome Carol329 to Polish Origins! I'm so happy to meet a new member and fellow grandchild of coal mining polish immigrants. My grandfathers also mined coal in PA - in Washington and Westmoreland Counties. 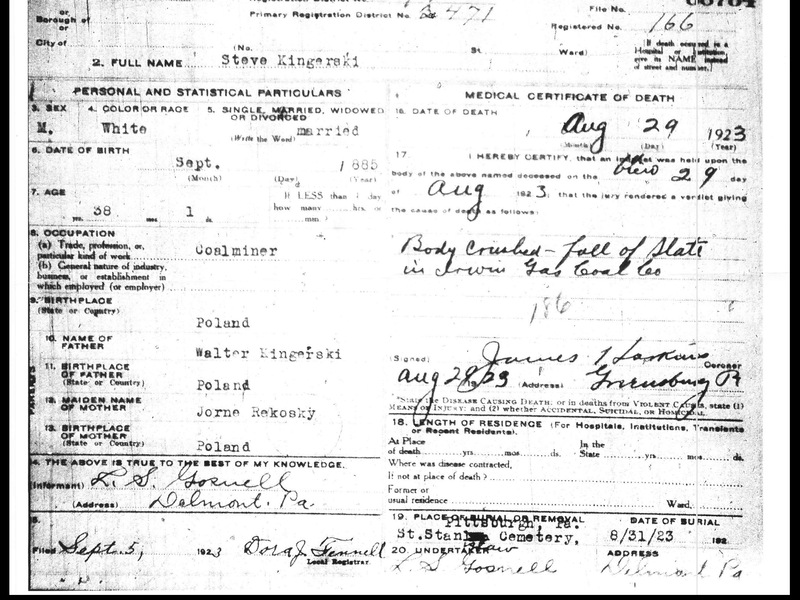 My Polish Grandfather was killed in a coal mine in Westmoreland County, PA in 1923. His Polish name was Stefan Kedzierski and American spelling was Steve Kingerski. Hi, I just joined this web site and was interested in the coal mining connections. My great uncle Andrew Kozloski emigrated to Pittston in the 1890's followed by two brothers Victor and my grandfather Michael in 1898. They got out of the mines and ran a hotel, a bar and did house building in the Pittston,Plains and Taylor areas. I believe that my grandmother was tHe niece of Andrew's wife Rose, according to info on the passenger's list. Can anyone help me find birth records for these people. They came from Grodno and Proniski. I just joined the site in Dec 2018 and saw your post. I grew up in Taylor and know the area well. My great-grandfather, grandfather, and uncles worked in the mines in Taylor. I am also reasonably familiar with Pittston. I'm not sure if I can assist you or not, but I can try if you would like to touch base. I am from northeastern Pennsylvania (Taylor & Old Forge, Lackawanna County, PA). My great-grandfather, grandfather, and uncles worked in the anthracite coal mining industry until it's decline. I am intimately familiar with the immigrant experience working in the mines of NE PA. In response to some posted potential theories, there were no "recruiters" in Europe... there didn't have to be. Waves of eastern European immigrants came to mining areas because work was plentiful for immigrants. They usually joined established communities of their own ethnic group. Most immigrants knew someone in the US who previously immigrated and relayed that work was plentiful. Generally, English-speaking immigrants (Welsh, Irish, etc.) had better jobs above ground. Eastern European immigrants generally had harder jobs below ground. The PBS station in NE PA did a great documentary series a few years ago. I found the documentary to be extremely accurate in describing the experience of my Polish family. Info and a link for additional information is provided below. The Extraordinary Journey Series - The Eastern Europeans focuses on the largest eastern European ethnic groups that settled here--the Polish, Slovaks, and Ukrainians. It also includes the historical contributions of an additional 20 ethnic groups, including Russians, Lithuanians, Hungarians, and Czechs. Hello all! I’m very glad to have found this forum and particularly this thread! My great great grandfather Stanislaw Kaczmarczyk came to the US in 1911 from “Dambrowa, Russia” and I did some research and its possible that the region he came from is the Dabrowa region or even more specifically Dabrowa Gornicza which is known for coal mining. But that’s rather speculatory and something i’d Like to confirm eventually. My great great grandfather eventually settled in Rices Landing, Greene County, PA and worked as a coal miner for 30 years. He eventually died of lung related issues, no surprise there.